Our shop in Hanford uses the latest collision repair technology to get you back on the road safely and quickly. Check out the gallery to see examples of the collsion repair and auto body repair work that we have completed! Any time you are on the road, you are unfortunately at risk of being involved in a collision. Be prepared and take an active role in the collision repair process by selecting Roberts Collision Center. Don’t be steered by your insurance company. After all, it is California State Law that you have the right to choose the repair facility of your choice and only need one estimate. Your vehicle is important and represents a large investment. Here at Roberts Collision Center your safety & the safety of your passengers is our number one concern and that is why we only employ I-Car trained technicians and use only up-to-date, State of the Art equipment to repair your vehicle and return it to its pre-accident condition. 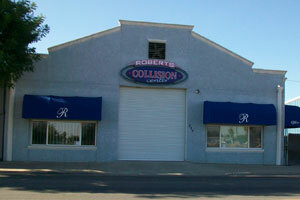 Roberts Collision Center has proudly been serving the Kings County area since 1995 at our 12,000 square foot state-of-the-art facility located in beautiful downtown Hanford. We are proud members of the Better Business Bureau in good standing with an A+ rating. We are also proud members of the California Auto Body Association. We stand by their motto Honesty, Integrity, and Craftsmanship. Our Company goal is to gain lifetime customers by providing them with excellent service and top quality repairs. Most of our repairs come with a nontransferable Written Conditional Lifetime Warranty. Thank you for the opportunity to introduce you to our facility. We look forward to serving you. Please stop by anytime and meet our courteous and friendly office staff. “I went to Robert's Collision Center in Hanford to get an estimate for some damage that was not my fault. Even though the damage was not major, it did require replacement of the hood. It was going to be a week long job and when I picked up my vehicle 5 days later as they had promised, I was very pleased with the work they had done. Not only did the exterior of the car look brand new, they offer a full cleaning of the inside of the car as a courtesy to all their customers, and therefore the interior looked brand new as well. Again we had to come to your business for the repair of my wife's car. As usual, nothing but the best. Right from the very beginning the services was outstanding (again). The rear corner had been damaged by a hit and run driver, who was later caught. The parts arrived quickly and so did the phone call to let us know to bring the car in. The bodywork was perfect as was the paint job. Your company always called us to let us know how things were going. Everything was ready the day we came to pick up the car. It looked as if it had rolled off the showroom floor. The inside was immaculate, all polished and cleaned. I had a bad experience with my car from a repair shop in Lemoore. I had to take my car back several times and still it wasn't done correctly. Nothing lined up and the car never drove right after that. I'm just sorry I listened to someone else who wanted to make a fast buck and could care less about their customer. I'm glad there is still someone who really cares about their name and business. And wants their customer to feel the same. Thank you so very much for caring and wanting to do it right (The first time). As always we will be back if the need arrives! Please never go out of business or move.